"Hommage" is "tribute" in French. On May 22, i.e. tomorrow, a "car beauty contest" Concorso d'Eleganza Villa d'Este 2015 will start in Italy, and BMW, among others, will present their third concept in Hommage Series: BMW 3.0 CSL Hommage. 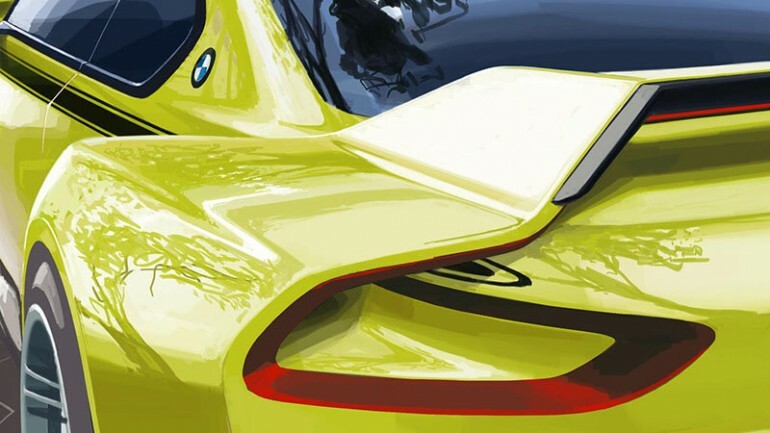 We still know nothing about it except for one image showing a piece of the rear part of the body wing an antiwing: thus BMW teases mass media and fans (like, come to Villa d'Este and see everything yourself, yeah). Well, on the eve of the contest I decided to recall two previous concepts made only in memory of BMW racing cars, and make a poster with all three Hommage models. 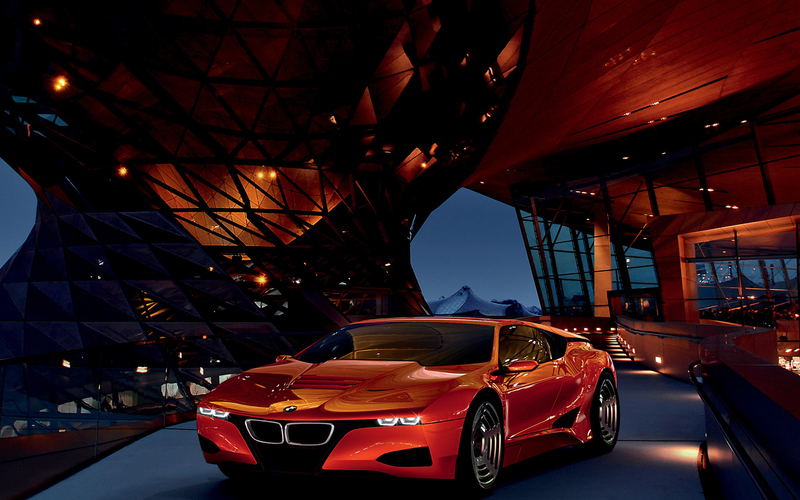 BMW M1 Hommage was shown at Concorso d'Eleganza at Villa d'Este contest in 2008. 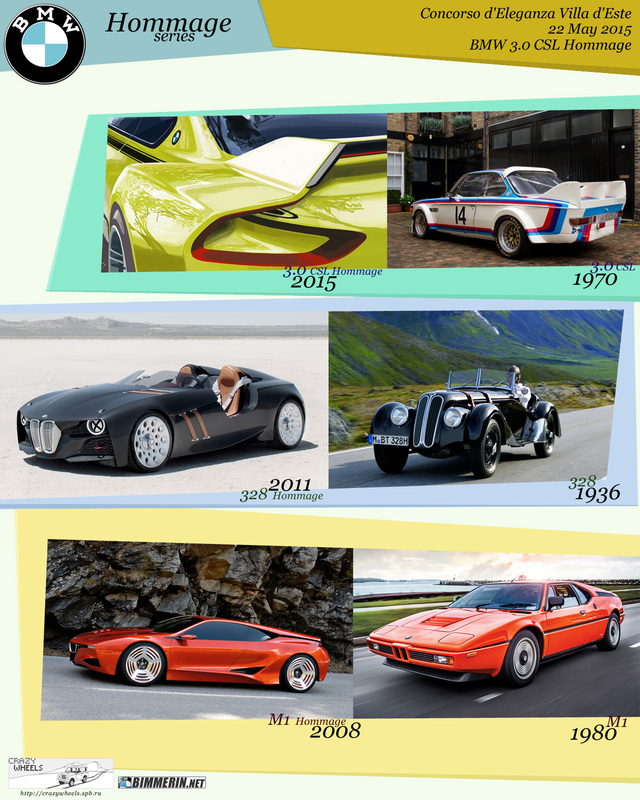 It was the first concept that BMW made as a “tribute” to the famous racing BMW M1 model, produced from 1978 to 1981 (its thirtieth anniversary was celebrated in 2008). BMW M1 was the only BMW model with a mid-engine layout which has ever been produced in series. In fact, as we now see after the time has passed, BMW M1 Hommage is the third car of five in the branch of one of the sports race cars in all the BMW family tree. Let’s see how it all began. In 1972, a talented designer Paul Bracq from BMW has developed BMW Turbo show car for 1972 Summer Olympics celebration in Munich. It was a mid-engine model based on BMW 2002 chassis with “Gullwing”-type doors and quite a futuristic design for those times. Two cars were created, and some design solutions were further used in BMW 8 series and BMW Z1. Then, in 1978, the M-branch of BMW has decided to develop a new racing model. BMW Turbo was taken and the basis. BMW has entered into an agreement with Lamborghini to build some parts of the chassis and designing a prototype of a new race car. Seven prototypes were made, but then BMW took full control of the project itself (due to not very satisfactory Lamborghini’s financial position). The design of a new model based on Turbo was made by a well-known Giorgetto Giugiaro. 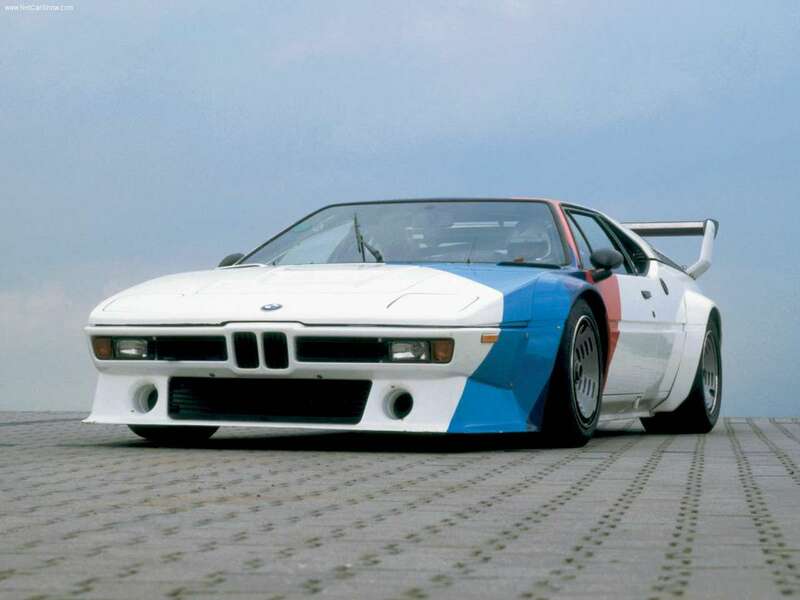 As a result of the project, BMW has built 453 instances of BMW M1, which makes this car one of the rare models of this brand; 20 of them were made specifically for BMW M1 Procar Championship. M1 has achieved considerable success in motor sports. In 2004, Sports Car International automobile magazine has positioned this car to 10th place in the "top of the best racing cars of the seventies". 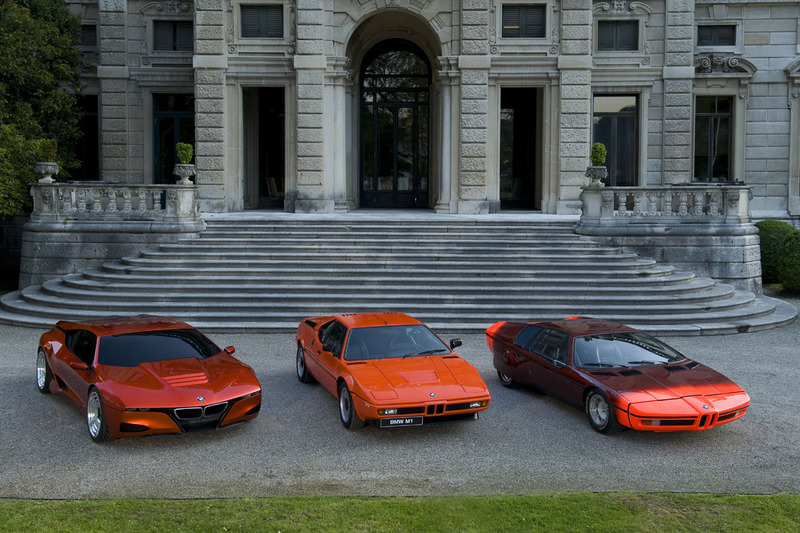 In 2008, as I wrote above, BMW M1 Hommage was released. In principle, like BMW Turbo, this was a show car: a single instance, futuristic design, enthusiasm of the public at the competition. However, it’s not that simple. 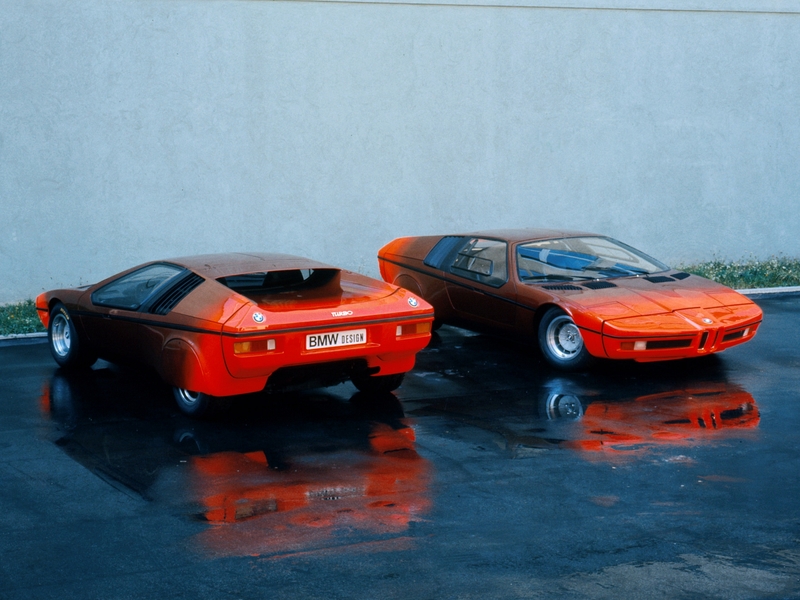 M1 Hommage was designed by Giorgio Giugiaro, and, as it turns out, caused a continuation like BMW Turbo too: first, this implicit continuation was BMW Vision Efficient Dynamics concept, and then BMW i8. This racing model refers to BMW 328, which was produced from 1936 to 1940. The author of its design was Peter Szymanowski, design engineer – Fritz Fiedler, worked at BMW. 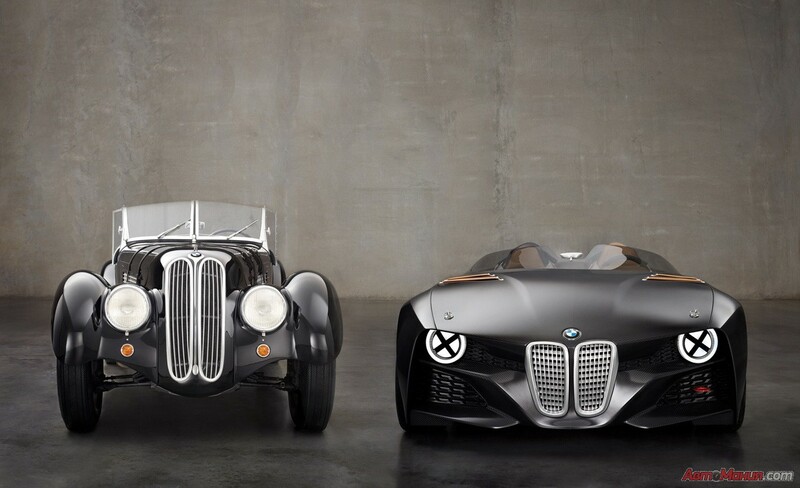 Creating a modern design while maintaining lines and motifs from the thirties is not an easy task (I think it is more complicated than in case of M1 Hommage), but by the 75th anniversary of BMW 328, contemporary designers managed to do it. BMW 328 was very successful in racing: just in 1937, it won more than one hundred races in its class. In 1938, the 328th won one after the other Le Mans, RAC Tourist Trophy, Alpine Rally and Mille Miglia. 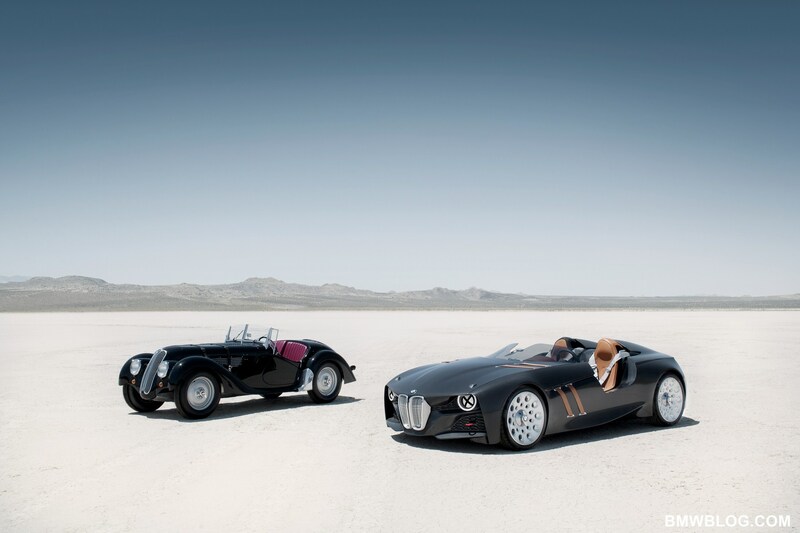 As for BMW 328 Hommage, the one inherited aspects that BMW boasted of, was a very low weight. This was achieved by using parts from carbon fiber and almost complete elimination of doors, as well as a very concise interior with all superfluous items removed. Unlike BMW M1 Hommage, 328 Hommage has not become a widely known donor for future models of BMW, and remained a memorable show car. As I already said, lucky people will learn about this model tomorrow at Villa d'Este competition in Italy, and ordinary mortals and not wealthy amateurs – ever afterwards. However, it is known that BMW will test many technological innovations in 3.0 CSL Hommage, and some of them will be used in future versions of BMW M2. So BMW continues maintaining the "Zeitgeist", "succession" and other "inheritance". And it pleases.